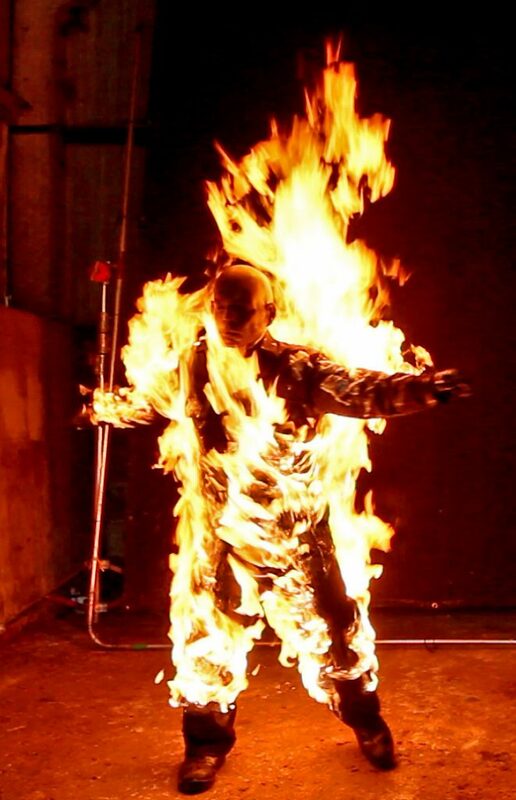 Full and partial fire burns, can be some of the most spectacular stunts you might have seen in modern movies today, but unless executed correctly, they can end in disaster. Each stunt burn is assessed on its own merits, and a process applied to work out how best to execute a safe and convincing fire burn. There are other factors which need to be taken into consideration, before we get down to any live fire. First and foremost would be choosing the right performer for the job. As any experienced stunt co-ordinator knows, it’s as much a mental state of mind, as well as being physically fit for the job. Having a level head and good spacial awareness are also key elements in helping pull off a a convincing fire burn. Once you have gone through the process and looked at all the elements, such as location, time of shoot, and Health & Safety issues, we then turn to the equipment. With years of experience in performing body burns, I have refined many elements of the burn, and now manufacture my own protective burns gel, which has become an industry standard. We also use many other elements to achieve the burns you see on screen, which have been refined over many years, through experience and a working knowledge of the Film & TV business. For further information please don’t hesitate to contact me, for a detailed breakdown of how we can enhance your next production, or more details of Fire Zone Safety Gel.